I do own pearl jewelry, but I rarely ever wear those pieces. I think it's because they are too classic (if such a thing exists). I'm all for romantic and feminine when it comes to jewelry, but there needs to be something else, such as a hint of edginess or simply a unique design. 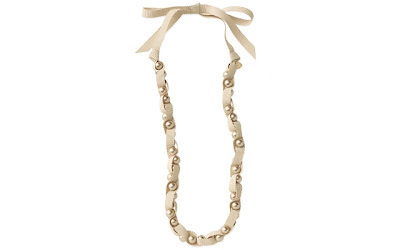 I find this Olivia Pearl & Ribbon Necklace from Stella & Dot to be very romantic, but it is also unique in design and color. My favorite things about this 50" necklace is the champagne color, which is feminine, sophisticated, and versatile. This necklace usually sells for $39, but through May 31st, it is only $23.40 as part of Stella & Dot's current promotion of up to 50% off select accessories. This means I only have until the end of May to decide if I want to add this necklace to my already extensive jewelry collection. If you didn't get everything you wanted for Mother's Day, you should checkout this sale!